Pressing sounds good to me, on the Cobraside version from the States. The noise you hear is also present on the CD version, so I think that's just how it was recorded. The vinyl itself is pretty quiet. I bought mine from the tour merch table and Adam signed it. We also took a photo and I didn't realize that Bob Mould was standing behind us talking to someone else and is seen in the photo until later. Think it was described as Strawberry & Cream Vinyl (or somesuch), rather than sand/blood by the label (as it isn't actually sand/blood coloured...). This album opens with a jangly riff. It picks up with a driving rhythm. Song after song is instantly familiar and slightly hypnotic like a pop album should be, except for one or two unfortunate moments. A few waves of distorted pitch-bending chords and generous tremolo put this album solidly in shoegaze territory, but its summery melodies make it almost a power pop record. Adam Franklin's laid back vocals keep the music cool. The album cover pretty much conveys the dominant emotion here. It's an album for a late summer afternoon ride back home. I got the double-LP. Sounds good. My only concern is I'm a little worried I'll listen to it so much it will wear out and I'll need to buy a new one. I was told 200 copies were pressed of this edition form the band when on tour, can anyone else confirm? I bought the double album and the quality was pretty bad, with distortion through the vocals and guitars especially, had to send it back. Cherry Records, what's going on? Pressing sounds good to me. Quality of vinyl is not really good. Probably single LP version is better. Great to have these guys back. They were truly one of the great bands of the 90's. Sort of like a marriage of Thin White Rope and "Sleep No More" era Comsat Angels with a touch of Hawkwind. 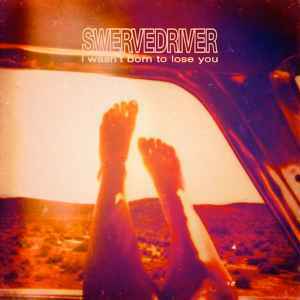 I think Swervedriver mopped up the floor with the likes of Nirvana. I Wasn't Born To Lose You has some stunning material that ranks with their best stuff. A Day Like Tomorrow and English Subtitles are my picks. A welcome return, I hope they keep it going because they are better than ever! Crappy quality album. Rough cut on outer edge, rough and tight spindle hole. Vinyl appears to be well thought out with a large lead in and large dead wax center on both sides, but the lead in is very, very goofy. It will lead the needle into a half-track and sound crazy until you pull the needle up and drop it again. Between the unpredictable lead in and the bad cutting job, I wanted to slap the careless factory that let this album leave without making it correctly. That being said the music is nice, if somewhat forgettable, with a sound that is a throwback to Raise, one of their finest albums in my opinion. I wouldn't recommend you go for the 2LP set thanks to the awful quality issues. Keep in mind, the colored limited edition albums may not have these problems. The red (100 presales in Australia) and the orange may be ok. I got the black albums.